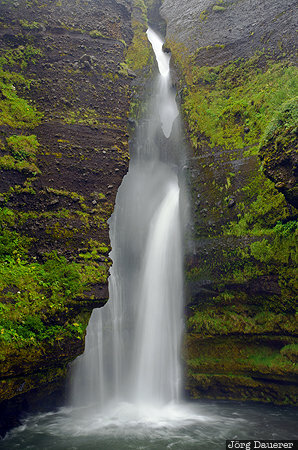 The waterfall Merkifoss (also called Gluggafoss) near Hvolsvöllur making its way through green mossy rocks. Hvolsvöllur is in Suðurland in the south of Iceland. This photo was taken at noon on a could day in August of 2013. This photo was taken with a digital camera.